A horseshoe simulation with digitized graphics and awesome sound. A horseshoe simulation with digitized graphics and awesome sound. 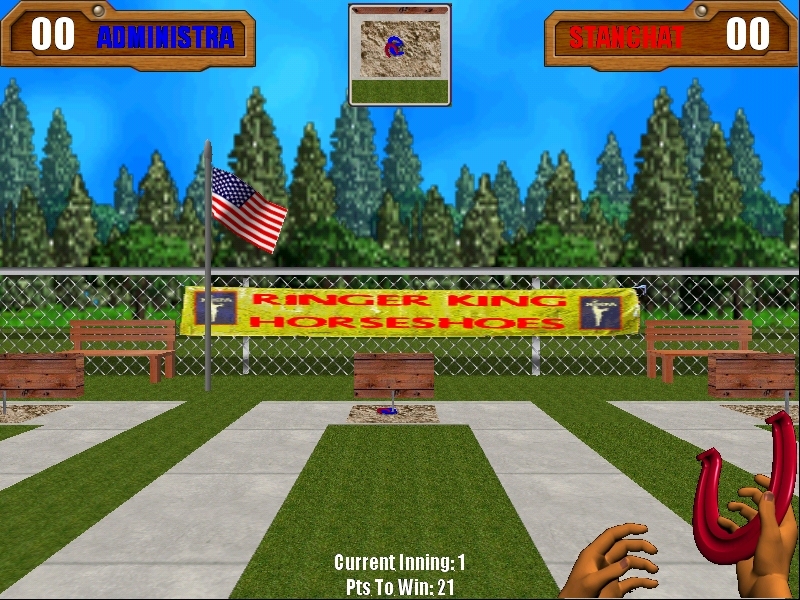 Play horseshoes like the pros with Ringer King 3D. In no time at all you will be flinging ringers like a pro with Ringer King 3D. Now with 3D gameplay. Digitized graphics and awesome sound. The best windows horseshoe simulation created. Digitized graphics and awesome sound. Play horseshoes like the pros with Ringer King. In no time at all you will be flinging ringers like a pro with ringer king for Windows. Now With 3D gameplay! Tennis Titans for Mac - a fun new Mac tennis game from Skunk Studios. Using a familiar break-out mouse control, you play with seven colorful 3D characters in either Classic Tennis or Rings Mode. Astrobatics - Burst through all the missions of the fierce space war in this excitingly intense action game. Turbogems - Turbogems is a cool gem matching game. Line up the falling blocks to make matches of 3 or more of blocks of same type. Nuclear Ball - Shareware games; New dimension of 3D gaming experience. Nuclear Ball 2 - Get ready to blow things up in the most explosive arcanoid-style game ever. Atomaders - Various enemy cyborg types. Make you way through enemy attack waves in your task of liberating planet systems from alien cyborgs invasion.